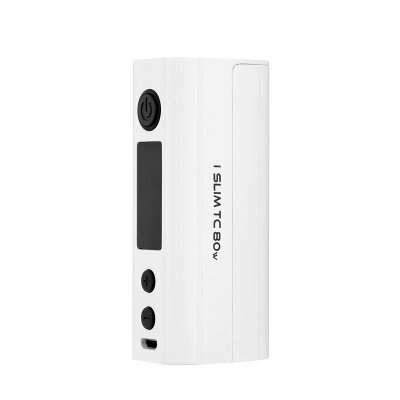 Successfully Added BetterLife iSlim TC 80W Box Mod Kit - 80 Watt, Temperature Control, 0.1 To 1-Ohm Resistance, 18650 Battery (White) to your Shopping Cart. For those of you that want to experience the ultimate vaping experience, Chinavasion’s vape shop introduces the iSlim TC 80W box mod from BetterLife. This extremely powerful box mod brings along a top-end vaping experience that is guaranteed to meet the needs of the most advanced and demanding vapers out there. Featuring a 510 thread, the iSlim TC 80W box mod is compatible with the vast majority of tanks and atomizers – providing you with plenty of possibilities to upgrade your device to meet your exact demand. This 80 Watt box mod is perfect for all vapers out there that are searching to experience the next level of vaping. Crafted out of a durable and stylish stainless steel material, this beautiful box mod is not only extremely tough but also nice to look at. Its compact and relatively lightweight design make the iSlim TC 80W comfortable to hold and, at the same time, extremely portable. Simply slide the vaporizer in your pocket or backpack and you’ll be able to carry it along wherever you go – allowing you to enjoy a relaxing and tasteful vape at any given moment. Thanks to its adjustable Wattage control that ranges in between 5 and 80 Watt, this electronic cigarette is perfect for beginning and advanced vapers alike. Added to its adjustable Wattage, the iSlim TC box mod furthermore features manual temperature control – allowing you to set the exact temperature needed to provide you with the perfect vape experience. With a resistance of 0.1 to 1-ohm this E-cigarette produces not only exceptionally large vapor clouds – it also brings forth the taste of your favorite e-liquid perfectly through which it allows you to enjoy your upcoming vapes even more. Simply attach your tank atomizer, fill it up with the taste of your liking, and this 80W box mod will provide you with a relaxing and tasteful vape experience like no other. Packing an epic 18650 battery (not included), the iSlim TC 80W vaporizer allows you to vape away the day and enjoy countless hours of vaping without you ever needing to worry about your battery life. The iSlim TC 80W box mod comes with a 12 months warranty, brought to you by the leader in electronic devices as well as wholesale electronic gadgets..